Manufacturing and using Ordinary Portland Cement (OPC) leading to 5%-10% carbon dioxide emissions as it is known to contain toxic ingredients such as silica and chromium. Furthermore, the growing awareness about the environmental hazards of OPC production as it requires high temperature for kiln operation is also raising questions about its consumption. Thus the fact that OPC production emits a high volume of carbon dioxide and greenhouse gasses has forced several builders, governments, and architects to opt for greener solutions. Owing to these reasons the demand for green cement has soared in the past few years. According to the research report, the opportunity in the global green cement market is expected to be worth US$38.10 bn by the end of 2024 as compared to US$14.80 bn in 2016. Between the forecast years of 2016 and 2024, the global market is projected to exhibit a CAGR of 11.3%. On the basis of application, the global market is segmented into non-residential, residential, and infrastructure sectors. Analysts project that the residential sector will lead the global market in the coming years due to growing density of the population in all urban regions. This has raised the demand for residential projects, which, in turn, has augmented the growth of the global green cement market. Furthermore, the growing infrastructural development in several emerging economies is also likely to favor the demand for green cement in the coming years. On the basis of geography, the global green cement market is segmented into Europe, North America, Asia Pacific, and Rest of the World. As of 2015, Europe accounted for the largest share in the global market. The phenomenal demand across Europe was attributable to the stringent regulations pertaining to carbon emissions and the growing tensions pertaining to the taxes that could be levied on industrial emissions. However, Asia Pacific is expected to surpass Europe’s share during the forecast period. 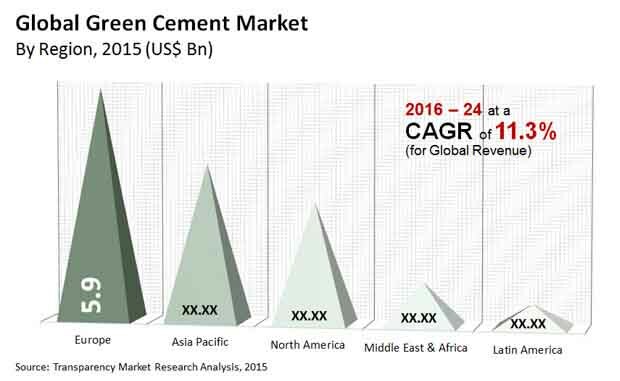 The growing number of construction and building activities and increasing infrastructural development are all expected to contribute toward growing demand for green cement market. Furthermore, growing initiatives by governments to take up green building initiatives for creating sustainable living spaces is also projected to augment the demand for these materials. North America is also expected to account for a significant share in the overall market in the coming years. The residential segment will be the leading consumer for green cement over the forecast period. The Middle East and Africa are also expected to show a keen interest in using green cement in the coming years as the region is planning on developing multifamily housing projects in the near future. The key players operating in the global green cement market are CEMEX S.A.B. de C.V., HeidelbergCement AG, LafargeHolcim., Taiheiyo Cement Corporation, Votorantim cimentos S.A., China National Building Material Company Limited (CNBM), Taiwan Cement Corporation, and Ecocem Ireland Ltd. The report includes an assessment of their financial outlook, research and development activities, and business and marketing strategies for the coming few years.